Today I saw in the supermarket a Carlton Football Club Advent Calendar. Is it so much worse than a calendar covered with Santas? In one sense no, but while Santa (Saint Nicholas) has a historical connection with a feast celebrating Christ’s birth, football has nothing to do with it. Except for the fact that football truly does have a religious function in so many Australian lives. It’s a trite thing to say – how many times have you heard it from the pulpit? And yet I feel it has become more true in recent years, and truer in more breathtaking ways. I’ve seen death notices in The West Australian which have a Dockers or Eagles logo above them, taking the place of a cross. A person’s football fanaticism will sometimes be noted as a key feature of their lives. Obviously people find comfort in this, and identity; that’s not all wrong – but it bewilders me. Even if people have no religion, is this what fills the vacuum? I can’t help feeling it is a sign of an emptiness at the heart of our society, a world which has been stripped of transcendent meaning, a world all surface and entertainment. I show my own scars here, growing up in a town where sport was everything, and in a Christian culture which very much bought into the importance of sport. But I do feel disturbed about that Advent calendar. What does it mean? What is the kid thinking about as he opens the football themed window each morning until Christmas to woof down a chocolate? 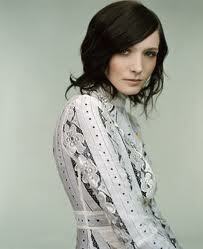 I always hear a sad aching in the songs of Sarah Blasko. Even at her happiest, her voice is tinged with melancholy. I understand she was a Christian in her youth, and her music has the sound of faith and certainty lost, the plunge into a dreamy world of beautiful sadness. There’s profundity mixed with cliche here, and I feel she delivers these lines in a tone that sounds too flippant. Yet I’m sure they come out of deep struggle, and her flippancy could be irony. ‘No-one knows just why we’re here’ is a haunting line. It’s haunting because I feel our plight is haunting. I can say, even as a committed Christian, that existence is mysterious, and that no-one knows for sure why we’re here. Faith is living with a particular answer as to why we’re here. What does it mean to ’embrace the doubt and face the fear’? A state of doubt as the best response to uncertainty? I choose to embrace faith rather than doubt, but I understand why she would go the other way. One thing I respect in Blasko’s lyrics is a determination to face the fear, to express the mystery of existence, when too few singers ask big questions. I came to a conviction a long time ago that the meaning of life is not found on our own – that it is found in community and in covenant. It’s an insight that needs to be freshly recovered, as our milieu’s individualism (which this song is so full of) is infectious, isolating. I half await, half dread her new album. I’ll listen to it too many times and her beautiful sadness will get into my head. “The Christening” (season 7, episode 7) is the most explicitly religious episode of The Office yet, and interestingly, it contains a subplot which illustrates Jesus’ teachings about discipleship. The setup: the entire office turns up at the christening of Jim and Pam’s baby, Celeste, and the episode revolves around the misadventures during the service and then at the reception in the hall next door. The church is not identified; it seemed to me the writers were striving to make it generically Protestant. But it’s obviously not Baptist and there is a woman minister; furthermore, several seasons ago Pam mentioned she was a Presbyterian. Look at that, look at that – that’s fun! We need to do stuff together, outside of work. Let’s go help Africa… Let’s go build an airport. We’ll start small, we’ll have a carwash, we’ll send some cheerleaders to regionals. Okay, we don’t have to volunteer, but I think we should hang out together more… Look at these people – these are churchgoing people and they know how to party… What is wrong with you guys? What is so horrible about trying to get together and do something nice? If the whole world were like you guys we wouldn’t have so many problems! … Nobody I know would leave their jobs and friends and families to do manual labour for three months. Michael: How long till we get to Mexico? Andy: Well, two days minus, how long we been on the road… forty-five minutes… so like two days, basically. Michael: What are we building over there again? Like a hospital? School for Mexicans? Michael: Why aren’t they building it? Andy: They don’t know how. Michael: Do we know how. I don’t know how – do you know how? Michael: I didn’t sign up for this. You guys are young! You want to give back to society! I’ve done that – I need to take! Michael and Andy get off the bus. They hadn’t counted the cost, and they didn’t want to pay it. It is a flattering portrait of Christianity – it shows Christian community as attractive but difficult, and the Christians themselves as welcoming and genuine. ‘Why have you always got to be so mean to me?’ – the only clip I could find from this episode isn’t from Michael Scott’s counting-the-cost story. Instead, Toby was once training to be a priest, and it’s his first return to church, presumably since his divorce. He hides outside (in the extras, even in a tree) before coming in alone to ask God the big question.